OASYS can quickly search millions of web documents (RSS feeds) in different languages to measure the amount of positive or negative opinion about a product, politician, or other desired topic and chart how that opinion varies over time. Computerworld magazine has named research projects by three ISR faculty members as winners in its second annual Horizon Awards for cutting-edge technologies. 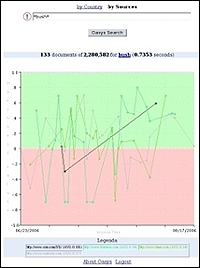 OASYS, a unique system for online opinion analysis developed by ISR-affiliated UMIACS Director V.S. Subrahmanian (CS/UMIACS), was selected for the award by an independent panel of senior IT executives. In addition, digital fingerprinting technology developed by ISR-affiliated Associate Professor Min Wu (ECE/UMIACS) and Professor K.J. Ray Liu (ECE/ISR) received an honorable mention. The Computerworld Horizon Awards were established in 2005 to alert readers to especially cutting-edge technologies from research labs and companies that are "on the horizon." This year's honorees were selected from more than 200 nominations.